Black and White Garage (near Newbury Berkshire) are advertising a couple of 500s on Autotrader website at the moment. They have definately got a White 1.4 Sport, and some of you may have seen it at The Italian Car Show at Gaydon last weekend. Is that definate then - I thought early next year before we saw them. blackandwhite garage wanting over £12000 for their Lhd lounge and sport is going to look a taddy bit dear when we get the rhd ones. My local dealer says next year still, but they are a bit pantspathetic and short on facts..
Have we got fiat staffers on this forum who would really know when 500s are due in Britain with the wheel the right side? In the showroom by end of Dec - that is greeeeaaaat news chuck. That suggests prices and spec will be given to dealers by / before december. No-one seems to actually know if get 1.2s or Lounge versions at launch date or not til some time after. Fiat will have to give dealers that sort of basic info to get them to take customer orders. 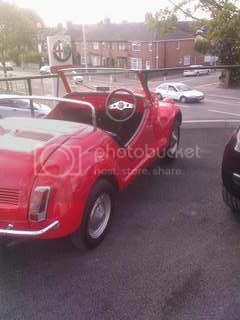 The advert says one owner, red,12 miles and says the price (9995)but its not for sale at all is it. In fact some might think it was a tad of a misleading way to get people into the business. That is the sales dept of where you work yellacky and that dig is in no way directed at you personally. Last edited by Ms_Cinq; 09-10-2007 at 13:18.
ms cinq u mean this 1? the link doesnt seem to be workin for me- im unsure bout what u sed about the sale part i dont know too much about that-so no offence taken! !